I love potato chips but they are not healthy and they give me a tummy ache. I have found a wonderful substitute, kale chips! The Best Kale Chips Ever! 2. 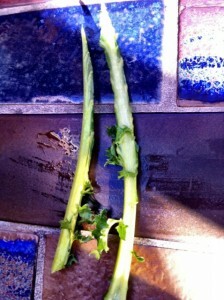 Cut the stem out of the kale (save the stems for juicing, if you have a juicer). 4. Dry any excess moisture from kale (use a towel or salad spinner). Place the kale in to a ziplock bag or plastic Rubbermaid type container (which is what I’m doing now because it’s easier to re-use the container than the bag). 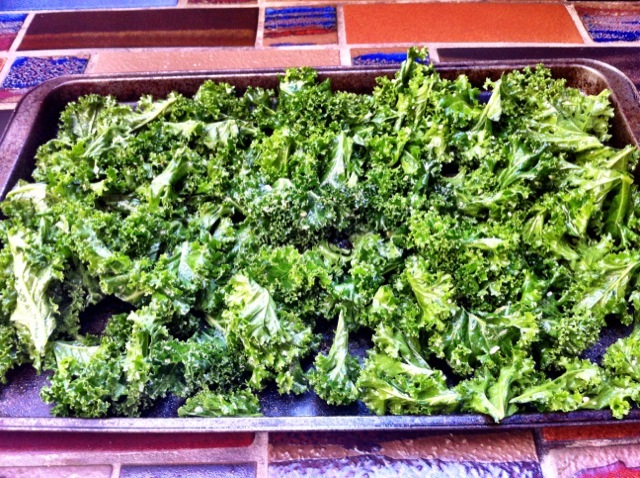 Put kale directly on cookie sheet. 5. Add grape-seed oil, garlic, cayenne pepper, sesame seeds, salt and pepper. (Olive oil will also work but I heard grape-seed is better for you when heated. You can add any spices you like.) Stir kale, spices and oil together on cookie sheet. 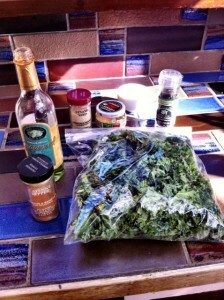 Seal the bag or container and shake really well to get oil and spices evenly coated on the kale. 6. Turn broiler on low. Updated: Preheat oven to 300°F. Put cookie sheet on middle or upper rack. Set timer and check kale in 10 minutes, stir, then check every 5 minutes until chips are almost crispy. 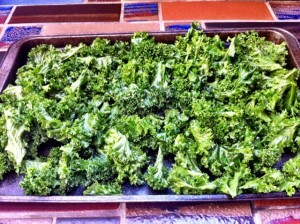 Gently stir kale around on cookie sheet each time you check, try to keep kale in a single layer on the sheet. Kale chips are tricky and can turn on you fast* (ie. burn to smithereens). 7. When kale chips are almost crispy but still a tiny bit un-cooked turn off the oven, keep oven door closed and let them sit for awhile to finish dehydrating. 8. 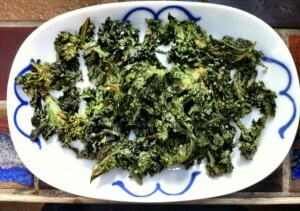 Remove crispy kale chips from the oven. Eat and enjoy! Please come back, leave a comment and tell me how your kale chips came out. *Kale chips burn easily and quickly. It’s important to watch as they cook and check them often. They taste horrible when burned. PS. Kale is good for poop. 😉 Keeps you regular. Be sure to “LIKE” Sally Around The Bay on Facebook for more Raves, Rambles, Recipes and Rants! Sally, I love kale chips! Thank you so much for the recipe. Nora – let me know how the recipe works for you! 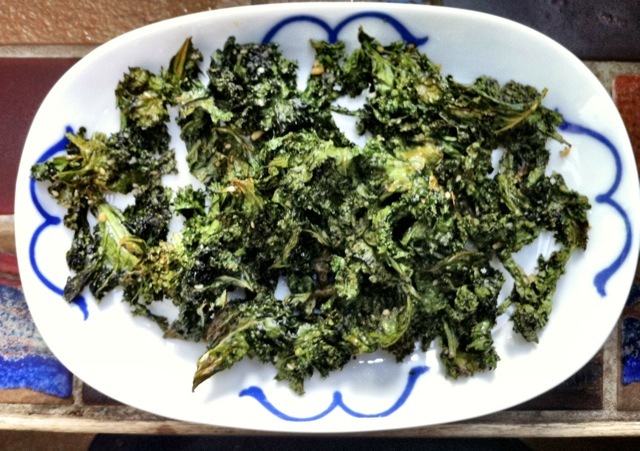 A dehydrator makes kale into chips without worrying about burning! Much easier than a broiler. 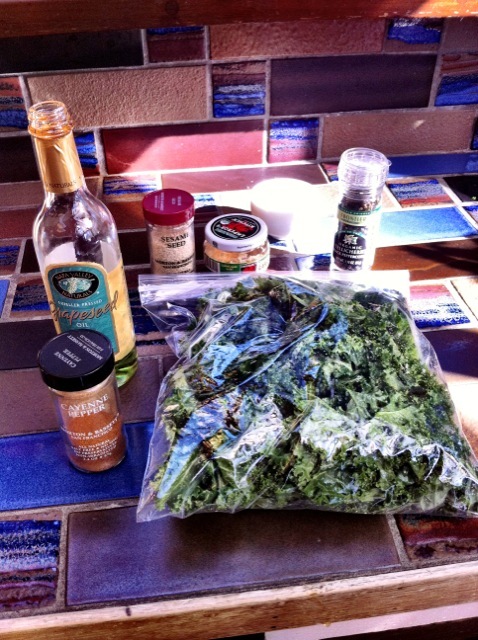 Ah, a kale chips recipe that makes sense! The low temp and then turning off the oven sound like exactly what I need to change. My last batch of kale chips were a disaster. If you don’t have a dehydrator, it’s nice to be able to use the oven. Sally- WOW! they are super delicious and so easy to make. I used the bag of already cut up kale from Trader Joes and took away the stem(not very many) and since the kale pieces are small I only cooked them for the first 10 minutes (in 295 degree oven), mixed them around, then another 5 minutes, mixed them around, then turned off the oven and let them sit in there for about 5-10 minutes…and…VIOLA! perfect homemade crunchy kale chips! Thanks for the recipe. 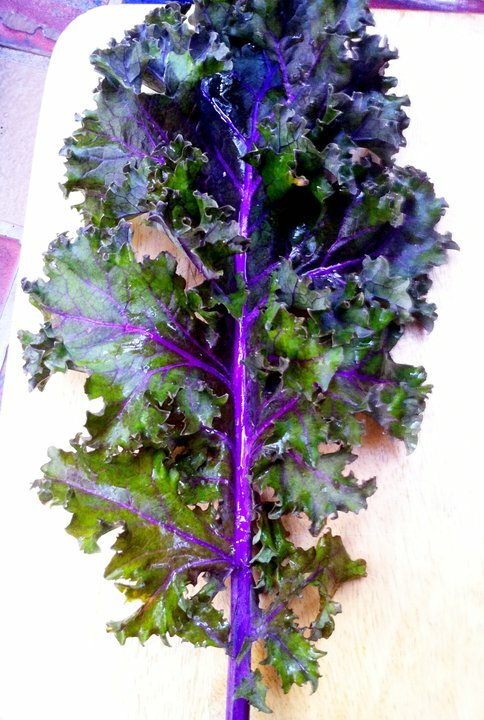 I bought some Kale yesterday and plan to try it. Sunset magazine also has recipes this month for Kale Chips. I guess the are the in thing. Our second try with Kale chips and we are hooked. What an easy way to make a tasty treat. Our first batch was a disaster, we couldn’t get the amount of oil right. This time we cheated a bit and used the spray butter for popcorn. It gives a bit of buttery flavor, while holding the spices. We can’t wait for kale to come in our Bountiful Basket again. Just made these today for my son and I and they were absolutely delicious! Can’t wait to try ’em!!! THANK You!